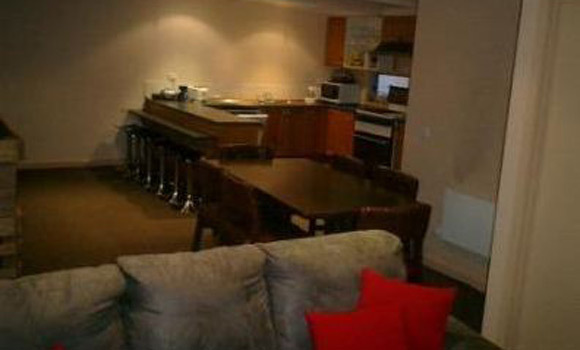 Halley’s Apartments are located in a prime position approximately 150 metres into the Falls Creek village (just follow Slalom Street) close to the Falls Express Quad Chairlift (no village shuttle required). The apartment is on two levels and can be set up as a 12 person or an 8 person share; is fully furnished; centrally heated; has an open plan lounge/dining and fully equipped kitchen area. Linen, towels and all bedding is supplied. 8 person set up – consists of 3 bedrooms, 2 of which can be set up as doubles or twins adn the 3rd bedroom is bunks; 2 bathrooms, 1 of which is an ensuite adn the 2nd bathroom is shared by 2 bedrooms. Halleys Ski Hire & Shop on the premises.